It usually takes a while to adjust to new living conditions, whether you’ve made the move yourself or someone else has moved in with you. After several months, it’s fair to say Keith and I have established a good little ‘routine’ with daily duties such as dinner, grocery shopping, laundry and other things. During our grocery trip this Saturday, we lingered in the produce department – everything seemed to look extra-good. We happened upon a batch of pears, which I don’t normally buy. K fondles picks up the pears and puts each one back, them obviously not being up to his standard. Rounding the corner, he utters ‘aha!’ and walks over to another batch, eyeing them like an old girlfriend. 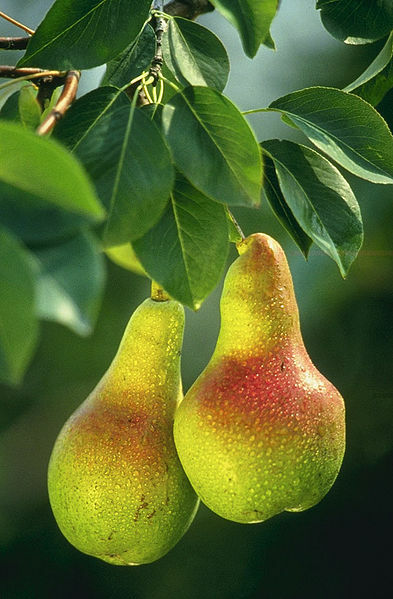 Since I’m a pear newbie, I can’t remember the type – Bartlett or Bosc, I think – they had bits of green and brown. 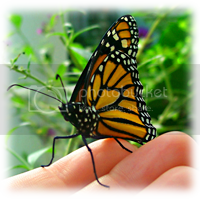 I watched as he gingerly picked a few up, felt them, smelled them. This flashed me right back to a scene from a favorite movie, City of Angels – of Meg Ryan picking up the pears and smelling them. Of Nicolas Cage learning how to do it by intently watching her. It looked like that exact same type of pear. Rain, rain, and more rain. And more in the forecast… bring it on, I say. We’ve had a bit of the wet stuff this weekend. I simply love thunderstorms. 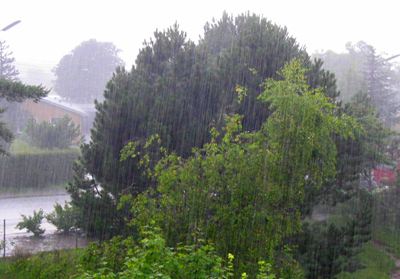 A good hard rainstorm seems to enhance whatever mood you’re in, which isn’t always a good thing. To me, the intense force of a storm is calming. I can sleep my very best during a thunderstorm. Two different rainbows arrived after the showers yesterday. Rainbows may be seen whenever there are water drops in the air and sunlight is shining from behind at a low altitude angle. The most spectacular rainbow displays happen when half of the sky is still dark with rain clouds and the observer is at a spot with clear sky in the direction of the Sun. This is why we often will spot a rainbow when it’s raining and the sun is shining. The result? 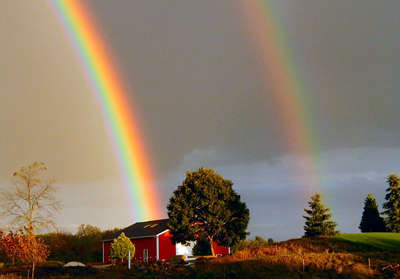 A breathtaking, sometimes double, rainbow. A beautiful rainbow that I want to hold onto forever. In other news, I saw the movie Inception yesterday. This is a must-see in my opinion! As much as I love dreams and the analysis of them, I really ‘got into’ this movie. Yes yes… I highly recommend. I got a full night’s rest last night without waking up even once, until about 0830 this morning. My guy took me to see the movie Eclipse last night, what a great movie. No, I am not one of those over-40 women who gush over the boy stars (but umm, let me say there’s only one that I still consider a boy…) 🙂 I think what I love so much about the saga is it’s the perfect mix of action, drama and romance. And let’s face it, it’s unrealistic – so the Piscean in me basks in that dreamy part of it too. Anyway, I won’t spoil it for you – just to say if you haven’t yet seen it, it’s a must-see. A day off, finally. What a joy to not have anything to do or anywhere to go. Pressing, that is. Time is at my own pace, and come what will. The weather is cooler, humidity is down, sun still shining, and hallelujah Praise God I’m off for three whole days. Even a simple trip to the grocery store and to tan was enjoyable this morning. Rode with the windows down and my hair blowing, just like it was spring again. Now, if someone would just invent a Virtual Vacation to the beach, I’d be just peachy. Everyone I know is either en route there, or on the way back. I’m serious when I say everyone. Well, almost. Most of my friends on facebook are, my daughter is, my cousins are, I don’t need to go on. Guess I’ll be there one day soon, hopefully. My friend is getting married at the beach on August 22nd, so I’ll definitely be there on that day even if I have to drive down alone for that. She so deserves this most perfect day in her life and I’m so happy for her.